Fourth graders love this tradition! 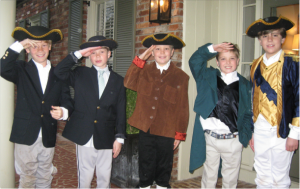 Typically held in February, the students will dress up as a colonial character and participate in a day’s worth of activities teaching them about early American life. Their character will also be on display in a living museum. Great photo opportunities! Held over three days in May and lots of fun! All parents are invited to the opening ceremonies on the first morning. Primary Center students will report to and be dismissed from the Main Campus on the first day. 3rd and 4th grades will have field day activities on day two and, finally, 5th on day three. As with so many Brandon activities, this event is very dependent on volunteers. With this link, APS allows you to view your child’s grades and attendance record in real time. You will need a student ID to register. Please call the office at either campus for assistance. Brandon’s Fall Festival – a community event held at the Main Campus playground in October. Bouncy houses, dunking booths, cotton candy, fair games and LOTS of volunteers! You will have a chance to sign up for a fun shift with other parents from your child’s class. Also look for advance wristband sales to save money and time! Students may bring lunch from home or can purchase from the cafeteria at either campus. Lunch visitors are encouraged to wait until after Labor Day so children have time to get used to their routine. There are designated tables for visitors at both campuses. Money can be deposited to your child’s lunch account here. BEE cool and follow the rules! Please park in the Howell Mill parking lot or on surrounding neighborhood streets. Please avoid blocking driveways or mailboxes and always park on the right side of the street. Be respectful of our neighbors and FOR THE SAFETY OF OUR CHILDREN, please adhere to the many posted no parking/no turnaround/no drop off signs. Meetings are held 3-4 times per year varying from morning, lunchtime and evening to provide opportunities for all to attend. Every effort is made to make these meetings informative, interesting and worth your time. Each class has 20-30 minutes of recess each day. Send your child dressed appropriately for outside weather! Timely registration and re-registration every April is very important and affects our staff allocation for the following year. EVERY child MUST submit a re-registration packet each spring. Remember that there is some document gathering and notarizing required so plan accordingly.